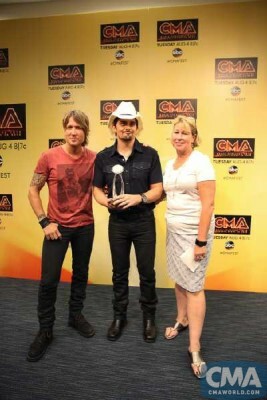 Backstage during CMA Music Festival’s closing night, Keith Urban and CMA Chief Executive Officer Sarah Trahern presented Brad Paisley with the CMA International Artist Achievement Award. 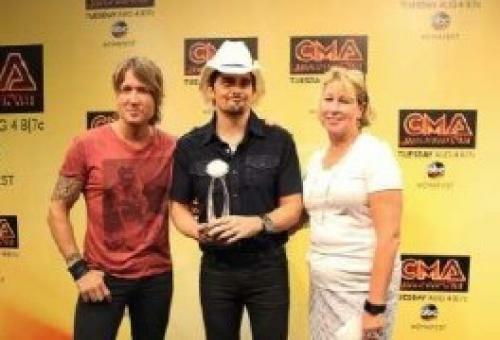 “I think Country Music works as one of the best ambassador type things you can do in an art form. When you send art forms of music overseas, it’s obviously something people flip out over and love, but I don’t know if it reflects real life like our format does. Any time you see people in Sweden loving Country songs and what they say and buying into what we are as artists, they’re seeing the real America I think. In that sense we have an obligation as a format to try and get this everywhere we can so they don’t think we all wear spandex,” Paisley added with a chuckle. Since being the recipient of this award in 2011, Paisley has remained dedicated to including the international marketplace in his schedule. In 2014, he headlined the C2C Festival in London and Dublin, as well as recorded the special “Brad Paisley & Friends” for BBC Radio 2 before going on to headline shows in Norway and Sweden. Through international honors and events including CMA World GlobaLive! and the expansion of the CMA Songwriters Series in Canada, Dublin, London, and Paris, CMA seeks to recognize and empower its international membership and Country Music fans globally.